The Director assigns each new student to the teacher who is most suited to the needs of that student. A request for a specific teacher will be considered. Teachers will contact students and their parents to find lesson times which are agreeable to all concerned. Every week the beginning student attends a 30 minute individual lesson and a 60 minute group lesson. The group lessons are an integral part of the learning experience for the student, and for that reason attendance is required. The parent must be present at both the individual and the group lesson. New beginning students and first year students are expected to practice 15 to 30 minutes each day with the support and help of a parednt. As students progress, the length of this daily practice will increase. Extensive experience has shown that the amount learned and the speed with which it is learned is directly associated with the amount of parent involvement. Your child learns the early piece by ear correctly. When learning new repertoire on the instrument the child has the new piece in the ear. Listening helps a child to recognize good intonation and search for a beautiful tone. By listening to future repertoire, a child is already beginning the learning process for those pieces and is motivated to strive ahead. Interval tapes and online interval training reinforce the aural skills learned in the group lessons. Recognizing intervals is a key to musical understanding and good intonation. Plus it is fun! Great music is an inspiration for all ages. Expose your children to the “Great Masters” of classical music – Beethoven, Mozart, Bach and many others. Let your kids take you to some concerts. 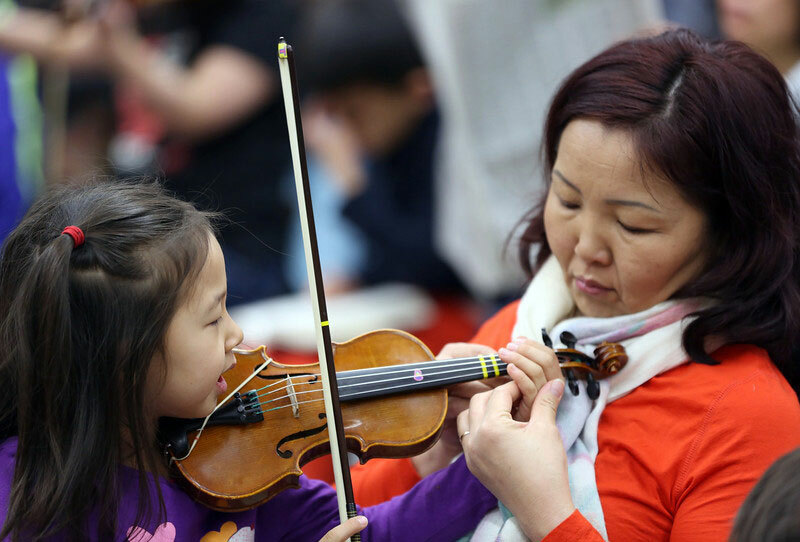 In addition to being present for all lessons and classes and supervising all home practice, parents are expected to provide the child with regular opportunities to attend classical music concerts, and to support and participate in fund raising projects and special enrichment events at the String Academy.